Pollys Burger Cafe. Games online. Summer is not meant just for sunbathing at the beach. Polly Pocket has decided to earn some pocket money during the summer holiday. Why don't your follow her example? 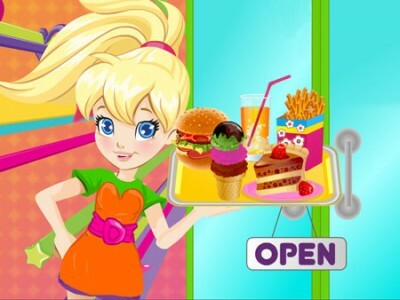 You can work with Polly at the local cafe, making burgers and serving drinks. If you work fast enough you can earn enough to upgrade the menu.